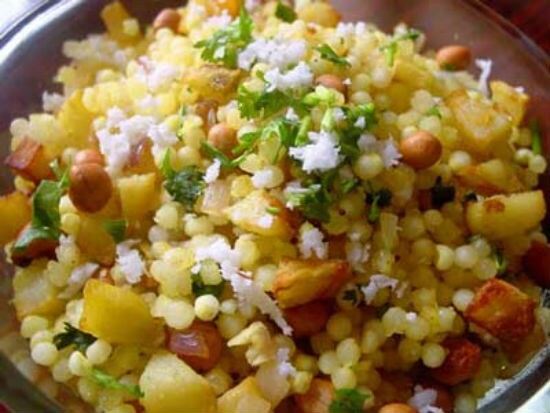 Sabudana Khichadi (Javvarisi Khichdi in Tamil) is a popular Maharastrian breakfast dish (often served as an evening tiffen as well) or during fasting for festivals like Navratri. 1. Add enough water to javvarisi and wash well. 3. Add curd and mix. Keep aside for 30 minutes. 4. Add peanuts, salt, coconut and mix well. 6. Fry the urad dal and mustard seeds for 30 seconds. 7. Add green chillies, ginger, onions and saute well. 8. Add the potatoes, javvarisi mixture and cook for 5 minutes. 9. When it starts to thicken, remove from flame. Feel free to comment or share your thoughts on this Sabudana (Javvarisi) Khichdi Recipe from Awesome Cuisine.